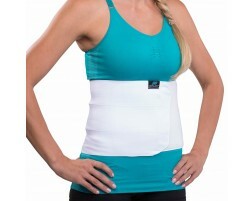 Abdominal binders provide support and compression to the abdominal, belly and rib area. The ab binder is similar to a belt where it completely wraps around the body and is ideal for post-surgery and post-pregnancy or postpartum support. Binders are often made of an elastic material for maximum flexibility and breathability. Our binders come in a variety of sizes and heights available for you to select the amount of coverage you want.